We might also be delighted by the inner workings of a pension, credit ratings and/or ISA choices. Google today extended their coverage of Google Streetview view to 95% of the UK. This means that it is now possible to use Google Maps and Street view to virtually walk through the streets of South Marston. For details of how to use Google Streetview, visit here. The group will be guided and supervised by an officer from Wilshire Wildlife Trust. The completion of this work will give us a blank canvas for a community group to work on. We hope that a community group can be established to take the Wildlife Site Project forward in design and maintenance as an ongoing scheme. A proposal we want to air with the volunteers is to have a competition for the layout design of the site. This can be a design by an individual or a group from within South Marston. The design proposals will be judged by external panel of experienced wildlife/conservationists. While we are confident that the combination of collaborative democracy and our council tax, business rates and local tariff incentives will be sufficiently persuasive to encourage local authorities to embrace development, we will also legislate to ensure that the production of new local plans will be achieved within a reasonable timescale. Specifically, we will legislate that if new local plans have not been completed within a prescribed period, then the presumption in favour of sustainable development will automatically apply. In other words, if a local planning authority does not get its local plan finalised in reasonable time, it will be deemed to have an entirely permissive planning approach, so all planning applications will be accepted automatically if they conform with national planning guidance. We will also put in place transitional arrangements to cover the implementation of our new planning system. On the question of projected housing numbers, local planning authorities have already projected the number of houses they (as opposed to the regional authorities) believed would be necessary by 2026 for local needs – the so-called Option1 numbers – and where they might most sustainably be developed. Unfortunately the present Government refused to believe that local authorities were capable of accurately gauging future local housing demand and, in many cases, interposed to impose significantly higher housing targets. We believe that the original, locally generated estimates are a reasonable assessment of housing need, including affordable housing. We therefore expect that these Option 1 numbers will be used by local authorities as the base-line for the projections that they provide to neighbourhoods at the start of the collaborative planning process, and will be used as provisional housing numbers in their Local Development Frameworks until their new local plans are completed. If I read all of this correctly, it means that the developers have free rein if Swindon’s local plan is not completed in ‘reasonable time’. Furthermore, the original figures agreed by Swindon for the period to 2026 (which I believe are 5,000 or so short of what was eventually imposed on them by the region) will stand as the projections on which they must build their local plan. 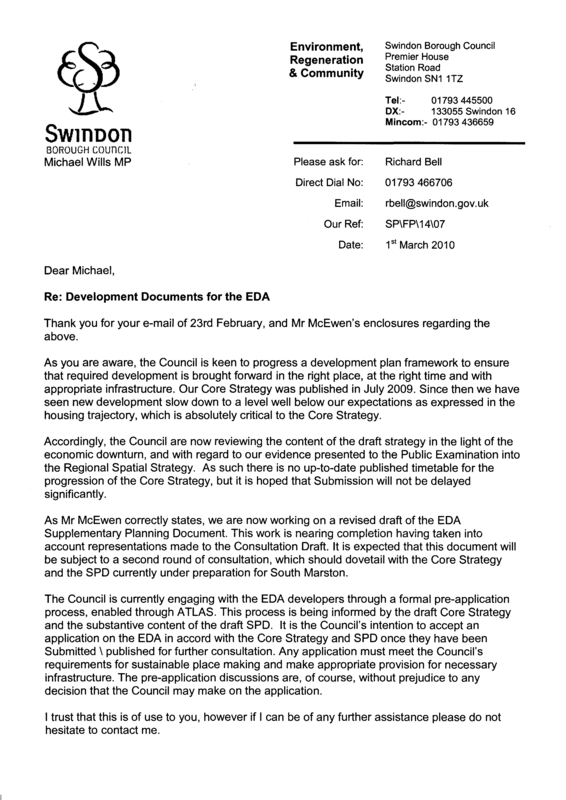 The letter below was received by Michael Wills MP from Richard Bell, Swindon Borough Council Head of Planning. It responds to questions regarding the timetable that the council is working to with regards to the EDA consultation and development process as a whole. A free training event is available for local residents, community activists, volunteers, front-line staff and anyone else involved in dealing with and/or tackling anti-social behaviour. Have you ever felt powerless to do anything about graffiti, vandalism or noisy neighbours? Do you want to know more about who you can contact to deal with problems like these and the powers available to help? This free event will offer practical advice to attendees on what can be done and how you can work together to tackle neighbourhood anti-social behaviour issues. It will pass on lessons from those who have succeeded in bringing about change through the power of collective action. For more details read the Original PDF advert. The cost of the friendly club holiday should be £229, and not £299 as described. The deadline for March 2010 issue is 15 March 2010.